Why Buy a Sittler Windrow Turner? 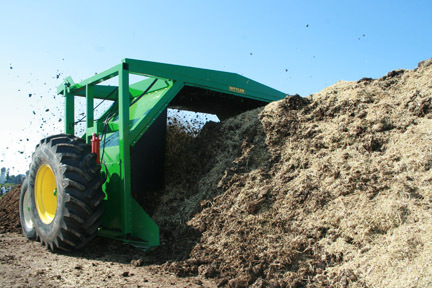 Sittler Windrow Turner Model #1014, above, is ideal for large agricultural, municipal & industrial composting. • Protective rubber flaps to stop flying debris and direct it back to the windrow. • The side scrapers are long, adjustable and shaped to be of maximum efficiency in moving the excess on the sides back into the windrow. • Square tubing is used for structural reinforcement and strength. Prevents the turner from twisting or going sideways in a heavy windrow. The tubing also ensures the longevity of the machine as it holds everything together. Protects the roof from caving and the machine from buckling. • Sittler has incorporated a double spiral of the drum knives to ensure balancing even under very adverse conditions such as an extremely dense, large windrow. • Extended knife holders provide extra holding strength. • Drum knives made of hardened steel are reversible. Reversible drum knives ensure longer performance and that the windrow remains clean right down to the ground, no possibility of a smelly, anaerobic layer forming. • Our gearboxes are also protected and are part of the machine, not a separate large box. • The Sittler turner and Inoculating Water Wagon have been tested successfully for consistency and performance by Dr. Elaine Ingham, founder of Soil Foodweb. Prior testing included a live situation where rice was thrown into the windrow, after one turn, samples were taken from various parts of the windrow and placed onto a clean surface. It was immediately evident that the mixing was very thorough with even distribution throughout the windrow. • The smaller machines model 507 and model 509 can be towed on most roads so it is not necessary to lift them. The 1014 and 512 can be moved on a flatbed. • Our fleece roller is unique to the Sittler machine; it makes using the fleece cover a simple operation. The fleece is picked up by the roller as the drum turns the compost and then gently dropped to cover the windrow. The fleece covers help control the compost cycle and enhance the quality of the compost. They are beneficial in wet and hot, dry climates. In wet climates or rainy seasons, the covers keep the excess moisture out of the windrow and in hot, dry climates/seasons they keep the moisture required in the windrow and protect the microbes from the hot sun. • Standard watering systems inject water or inoculants into the windrow. The systems may be hooked up with an optional tow bar, which pulls a water wagon or may be connected with an extended hose to a reservoir. • We offer effective consultation, online training and procedure tracking with database formula calculations for making quality compost. Your questions are welcome at our "One Stop Compost Shop".